“Nothing is so beautiful as spring,” wrote the poet Gerard Manley Hopkins. He didn’t live in Boston, where spring brings with it almost any weather; this week it’s wall-to-wall rain and gray. So here’s a little dose of Shakespeare in the hope of sunshine and optimal flower-viewing. 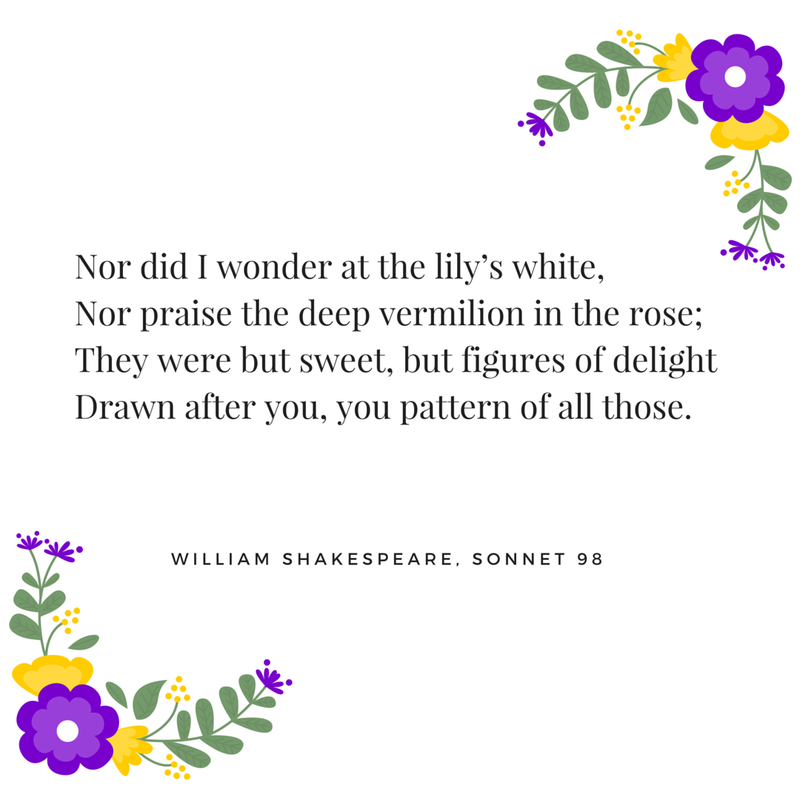 Have you read any spring poems lately? For us, it’s more like summer already! Nice poems! No, not lucky at all. Summer is unbearable and lasts from April or May until October. Yes, that’s why I’m moving to Washington this fall! I’ve always been curious who else knows this song? I’ve never heard it anywhere else. Any idea? Deep down, I know they do! I don’t know this song but it’s sweet–what’s the tune? Miserable week of weather! But good for reading! So true–if only I could find more time to read! I’m giggling about how very very nasty indeed the Midsummer Night’s Dream bit gets after that. Oh Oberon. He really is such a jerk. My husband was a contributor to a spring anthology of poetry and prose issued earlier this year by the Wildlife Trusts in Britain and edited by Melissa Harrison. It includes this sonnet plus poems by Hardy, Lawrence, Larkin, Hopkins, Chaucer, and Browning. How delightful! Is there a link to read your husband’s piece?